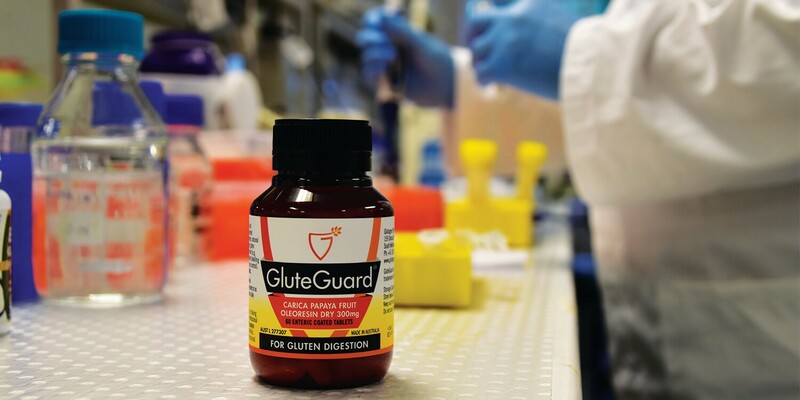 GluteGuard is uniquely formulated to digest gluten and help prevent the debilitating symptoms experienced after accidental gluten ingestion. When you take GluteGuard immediately before a meal, the tablet’s enteric coating enables it to pass through the acidic environment of the stomach and into the small intestine. The coating dissolves in the small intestine, releasing natural enzymes to fight the toxic gluten peptides by cutting them into much smaller fragments that are harmless. By breaking down the toxic peptide fragments, GluteGuard stops them from damaging the small intestine lining or triggering an immune response. This helps to prevent the unpleasant symptoms of gluten sensitivity. help you manage your gluten-free diet. As a listed complementary medicine (AUST L 277307), GluteGuard is designed to prevent the symptoms of inadvertent gluten ingestion. This is particularly important when ingredient labelling is unclear, or when food preparation is out of your control. Even tiny amounts of gluten can cause severe symptoms in gluten-sensitive individuals, and cross-contamination is surprisingly common. GluteGuard is recommended for anyone on a gluten-free diet who wants to guard against the risks of gluten cross-contamination and avoid the symptoms of accidental gluten ingestion. Please note that GluteGuard is recommended to be used in conjunction with a gluten-free diet. It cannot replace a gluten-free diet.